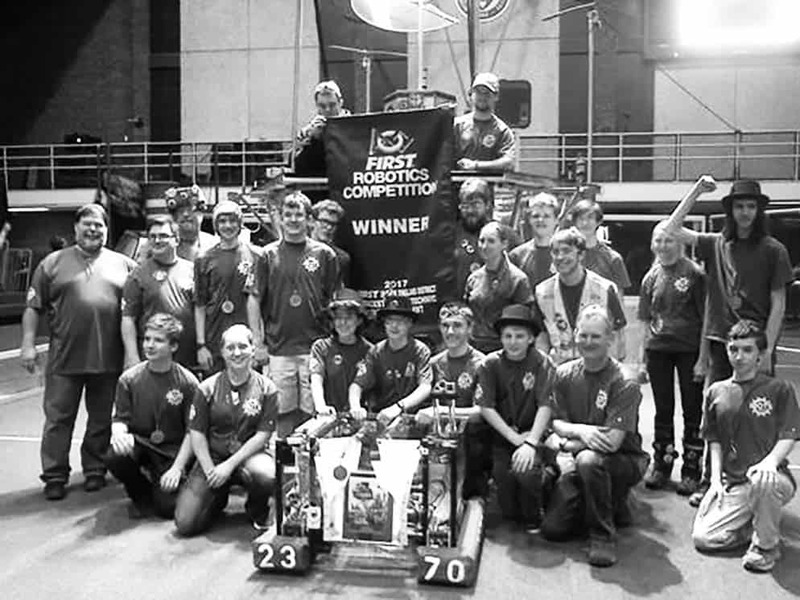 Area high school students from Rutland captured a win this past weekend at the FIRST Robotics District Event at Worcester Polytechnic Institute in Worcester, Mass. There were 40 teams from all over New England competing in this year’s challenge, including FIRST Team 2370, the IBOTS from Rutland. The IBOTS competed in a game called FIRST Steamworks for two days and were selected as alliance partners by Team 3623, the Terror Bots from Leominster, Mass. and Team 1991, and the Dragons from Hartford, Conn. for the playoffs. After a dozen playoff matches, the IBOTS and its alliance partners won the finals in three hotly contested final rounds. The IBOTS next event is the Southern New Hampshire District Event in Bedford, N.H. from March 24-26. The winning team poses for a picture at the Worcester Polytechnic Institute.